Peter Max Continues To Impress! During our sunny, warm autumn in greater Cleveland, we were host to a renowned pop artist’s exhibit which warmed the soul! Peter Max had a retrospective of over 125 works of art at the Beachwood Community Center, in Beachwood, Ohio from October 16-25, 2015. Peter Max was available in person for the last two days of the show, to meet the public and to personally sign purchased artwork. I was able to attend the event, and converse with him. On two other occasions I also met him, once at his art exhibit in Little Italy, Cleveland, Ohio, and once at the Rock Hall. On one of those occasions I received a personalized autograph in exchange for a 1971 Peter Max Paper Airplane book that I had brought with me with intentions to have him sign. And, I recall an exhibit of his at Tower City one year that I attended with my late mother, which we both enjoyed. Personalized autograph from Peter Max. I am continually impressed with his work, the use of color, and the energy the work transmits. I love the use of broad multi-color brush strokes, and ever-changing subject matter and evolving style. If his work comes to town again, I will surely go to see it, to be once again inspired. Peter Max exhibit at Peter Max exhibit at Beachwood Community Center, Beachwood, Ohio. Nearby trees were decorated in anticipation of the exhibit. 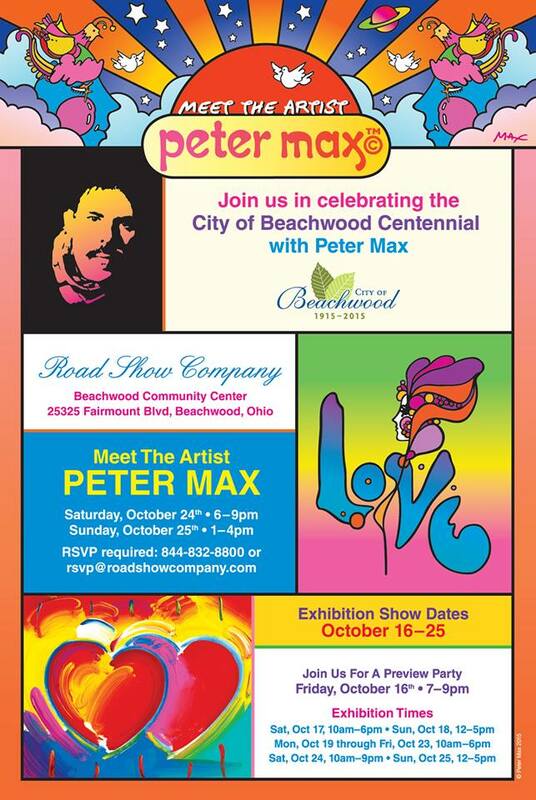 Peter Max exhibit at Beachwood Community Center, Beachwood, Ohio. Nearby trees were decorated in anticipation of the exhibit. Peter Max exhibit at Beachwood Community Center, Beachwood, Ohio. You are currently browsing the Janet Dodrill's Blog blog archives for November, 2015.